Hello. I'm Nicole Arnold, of Mathnasium of Grande Prairie AB, your neighbourhood math-only learning centre. We help kids in grades 2-12 understand math by teaching the way that makes sense to them. We are located at 9901 97th Avenue, Unit #103 (lower level) in Stewart Square. Parking located behind the centre by alley way access as well as ample street parking. Our staff is passionate about helping your child become more proficient in math while making make math make sense! We offer year-round programming. Call us today at (780) 832-0280 for a RISK FREE Assessment! Our Daughter is making great progress and most importantly feels positive and more confident about math. We have very much enjoyed our experience so far with Mathnasium. My son has been able to catch up on many math skills he was behind in. For the first time in 4 years he is not only passing math, he is achieving abode 80%. He says he would recommend this program to his friends if they were struggling with math. Great atmosphere, super friendly staff. Always welcoming. My daughter has been attending for just over a month and has already brought her math mark up. She enjoys math much more now that she is understanding it. Can't wait to see her next report card. 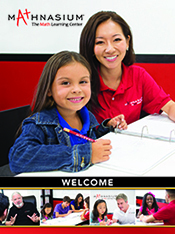 The staff at Mathnasium has helped inspire confidence in our daughter in math, as well as every other subject area. She is now understanding math, thanks to the incredible teaching skills of the Mathnasium staff. Nicole is amazing and has went above and beyond in finding ways to explain math so that it makes sense. She has gone out of her way to teach the necessary concepts to our daughter before math tests at school, so that she achieves success! We cannot speak highly enough about Mathnasium! If you’re considering Mathnasium for your child, just do it, you won’t regret it!!! My daughter feels so much fore confident with the math concepts she has been taught. Her grade has risen 25%. She really enjoys the mathnasium instructors and environment. It has been great for her. The teachers at GP Mathnasium are knowledgeable and celebrate a student when goals/milestones are met. I have seen my son’s confidence grow! Such a bright post atmosphere! My daughters confidence in learning has improved not only in math but in all subjects. We highly recommend Mathnasium! My child really like the program and she learn lots Thanks for all the teacher specialy to miss nicole She is great person. My son has been learning and feeling come confident with math and he says he would refer friends needing math assistance. Our children are really learning well with the help of the Mathnasium teachers! They both really enjoy going to Mathnasium and there’s never any complaining about going... even on Saturdays, this is how we know the teachers are making learning fun! A huge highlight is getting to play Sleeping Queens with Nicole! Piper is no longer anxious about math class. She has a new confidence that brings me joy. She has already referred one friend to the program. She very willingly attends and is proud of her work. Thanks so much. We are very pleased with the program. We are loving our experience at mathnasium. Very happy with my daughters progress. Nichole has been a wonderful individual to work with. So far it seems all the staff she employs are well regarded and knowledgeable. Aside from the stark monthly cost, it has been a worth while experience. My daughter enjoys going to Mathnasium and her confidence with math is increasing. She loves the atmosphere at the centre!